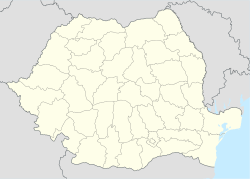 Jimbolia (Romanian pronunciation: [ʒimˈboli.a]) is a town in Timiș county, Romania. In Banat Bulgarian, it is known as Džimbolj, in German as Hatzfeld, in Hungarian as Zsombolya, and in Serbian as Žombolj (Жомбољ). The earliest record of a community in this location is a place identified as Chumbul in a papal tax record in 1333. This place came under Turkish (Ottoman) administration in 1552. As a result of the Treaty of Passarowitz this place came under Austrian rule in 1718. The surrounding region had become seriously depopulated during the period of Turkish rule. Jimbolia was colonized in 1766 by German-speaking settlers (Danube Swabians) who named their new community Hatzfeld. After 1867 this community was also officially known as Zombolya. The town came under Serbian military rule on November 17, 1918. As a result of the Paris Peace Conference, the town came within the Kingdom of Serbs, Croats and Slovenes. As the result of an adjustment in the border between Romania and the Kingdom of Serbs, Croats and Slovenes, it became part of Romania with the name Jimbolia on April 9, 1924. At the same time, the village of Modoš was transferred from Romania to the Kingdom of Serbs, Croats and Slovenes. The painter Stefan Jäger, known for his depiction of Danube Swabian life and history, lived in the town from 1910 until his death in 1962. Formerly, the town was populated mainly by ethnic Germans, but as result of emigration, the Romanians currently form the largest ethnic group. Wikimedia Commons has media related to Jimbolia. ^ Peace Handbooks, Vol. 1, Austria Hungary, issued by the Historical Section of the Foreign Office (U.K.), London, 1920. ^ Ortsgeschichte von Hatzfeld, by Paul Martin, Banater Buchverkag, H, Anwender & Sohn, Timisoara, 1943. ^ Die Temesvarer Zeitung als Banater Geschichtsquelle (1852-1949), by Alexander Krishnan, Munich, 1969.